Title: 05/15/1997 - Requirements for labeling portable fire extinguishers. The purpose of this letter is to respond to your request of February 18, to the Occupational Safety and Health Administration (OSHA), requesting an interpretation of the Hazard Communication Standard (HCS) 29 CFR 1910.1200 requirements for labeling portable fire extinguishers. Please accept my apology for the delay in this response. The purpose of the Hazard Communication Standard is to ensure that the hazards of all chemicals produced or imported are evaluated and that information concerning their hazards are transmitted to employers and employees. This transmittal of information is to be accomplished by means of comprehensive hazard communication programs, which are to include container labeling and other forms of warning, material safety data sheets, and employee training. All employers are required to provide to their employees information about any hazardous chemicals known to be present in the workplace to which employees may be exposed under normal conditions of use or in a foreseeable emergency. As an employer you are required to develop and maintain at each workplace, a written hazard communication program which at least describes how the criteria specified in paragraphs (f),(g), and (h) of this section for labels and other forms of warning, material safety data sheets, and employee information and training will be met for your employees who may encounter hazardous materials during the course of their employment. 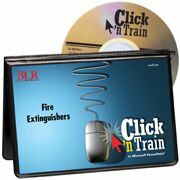 Fire and extinguisher training videos and pamphlets at SafetyEmporium.com. If your employees are handling fire extinguishers that contain a hazardous substance it would be your responsibility as a employer to ensure that the extinguishers are labeled properly, material safety data sheets are available for the hazardous substances contained within, and your employees have been trained adequately to protect themselves from these hazards. Service personnel who are performing visual inspections or maintenance on fire extinguishers need to know accurately and positively whether the specific contents are hazardous and how to protect themselves from exposures. Portable fire extinguishers manufactured prior to 1991 are not exempted from the labeling responsibilities found in the hazard communication standard, and it is every employer's responsibility to ensure that all employees are provided information and training as needed to perform their jobs safely. Get every kind of fire extinguisher imaginable at SafetyEmporium.com. Based on the manufacturers/importers' hazard determination, if the fire extinguisher agent is classified as a hazardous chemical, then it would be subject to HCS labeling requirements. The HCS defines hazardous chemicals as any chemical which is a physical or a health hazard. Under the standard, a compressed gas (defined as a gas or mixture of gases having, in a container an absolute pressure exceeding 40 psi at 70 degrees, or a liquid having a vapor pressure exceeding 40 psi at 100 degrees), is considered a physical hazard and, therefore, is a hazardous chemical. In addition, several extinguishing agents (Halon 1211 and potential substitutes such as hydrogenated chlorofluorocarbons) are also considered hazardous chemicals by nature of their associated health hazards. DOT also classifies fire extinguishers as hazardous materials (49 CFR 172.101) with specific exceptions noted at 49 CFR 173.306(c). In the cases where you are acting as a distributor of hazardous extinguishing chemicals or charging the cylinder and creating a compressed gas hazard, you are responsible for ensuring that the extinguishers are labeled in accordance with paragraph (f)(1) of the HCS. In those instances where your services do not involve adding or supplying a hazardous chemical to the extinguisher or charging the cylinder, your firm would not be considered a distributor and consequently would not be responsible for the labeling of the extinguisher. Safety Emporium.com carries hundreds of extinguisher signs and accessories! I hope this response addresses your concerns regarding OSHA's Hazard Communication Standard. If you have any additional questions, please contact Maureen O'Donell at the Office of Health Compliance Assistance at (202) 219-8036. We conduct various fire protection industry service and maintenance training programs throughout the United States. Recently, questions concerning the specific intent of the Hazard Communication Standard have been raised pertaining to just who shall label extinguishers, exactly which portable fire extinguisher containers must be labeled, and how positive verification of these contents is to be determined. Get these super-sticky HMIS-style labels, signs, posters and more at SafetyEmporium.com. In 1989 the National Fire Protection Association's standard for portable extinguishers (NFPA- 10) adopted the HMIS system for identifying the contents of portable fire extinguishers upon their nameplates and to comply with the federal Hazard Communication Standard. The 1990 edition of this standard contained an exception for any extinguishers manufactured prior to the new standards implementation date of July 1, 1991. After this date, the independent testing laboratories required all manufacturers to furnish HMIS information for all extinguisher contents and various extinguishing agent formulations sold in portable fire extinguishers. Typically, when fire extinguishers are recharged with new or replacement contents, service personnel can utilize the specific information provided by the "contents manufacturer" to update or maintain accurate HMIS label information on the extinguisher. The contents of portable fire extinguishers are periodically required by the NFPA standard to be emptied and visually examined at regular intervals, which never exceed 12 years. Understanding that HMIS labels need to accurately identify the specific contents to provide important health and safety recommendations, the fact is, most extinguisher service personnel do not have the ability to positively identify an extinguisher's contents visually. While generic extinguisher HMIS labels are available, using them without accurately determining or knowing the exact contents may not necessarily meet or fulfill the real intent of the Hazard Communication Standard. So, if the Hazard Communication Standard requires HMIS labels on all of the older fire extinguishers manufactured prior to 1991 or whenever the extinguisher contents are not positively known, the monumental cost of replacing all of these extinguishers with "new" known contents for compliance, is going to be extremely costly and impractical. If portable fire extinguishers manufactured prior to 1991 containing their original contents. are exempt from having HMIS labels applied by service personnel in the field. If portable fire extinguishers without HMIS labels are required to have the contents positively verified and/or have the contents replaced with known contents and a new HMIS label applied by service personnel in the field. If portable fire extinguishers manufactured prior to July 1, 1991, are only required to have new or replacement HMIS labels applied to them only when the specific contents are accurately verified or known by the service person, such as during a recharge situation. Your help and interpretation on this matter would be deeply appreciated and help to ensure that our training classes continue to put out accurate service information.